In the German language the word BAUHAUS consists of two words linked together. BAU can mean several things: build! or building or construction. HAUS simply means: house. So, whenever we say BAUHAUS, we are saying: „build a house!“, if we stay with the literal meaning. A house is a box, is a cube, is a volume in which people „place“ their belongings or themselves. A house has an address and implies a sense of belonging(s). Moving from one place to another, we need boxes which „house“ our belongings, if we still have any…if not we are „home-less“. In Germany, BAUHAUS is also the name of a popular chain of timber shops for house-builders . And lastly and most importantly, THE BAUHAUS is an attitude and style of architecture and design, which we are all familiar with, especially in Tel Aviv. 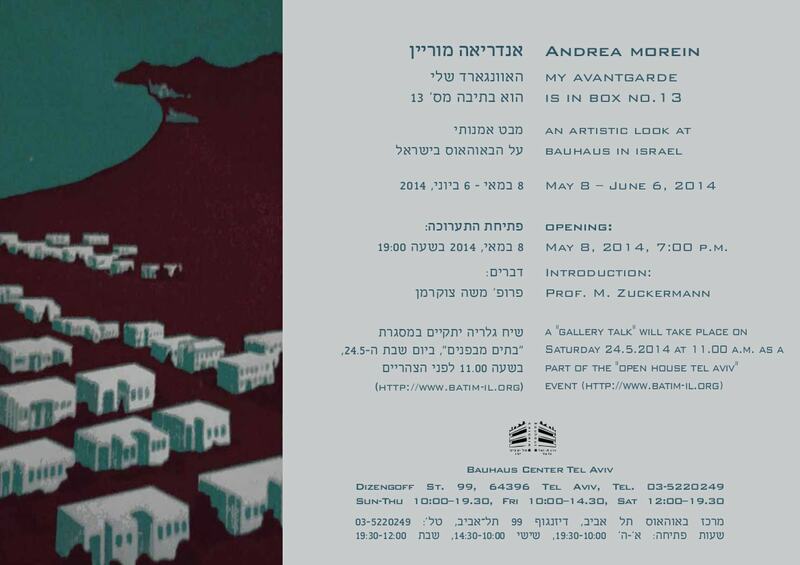 So, no wonder Andrea Morein’s photographic adaptations of Bauhaus in all its implications as mentioned above, are now being presented in the BAUHAUS CENTER in the heart of Tel Aviv. The digitally adapted documentary photo-works are a personal examination of the architectural icons and images of the early Fifties in Israel. A period, when new settlements were hailed by a special edition of envelopes issued by the Israel Post Office whenever they opened a new „snif“. Nowadays, these envelopes are collectors’ items. A number of these, belonging to the artist’s personal archive, will be on display as part of the exhibition. Morein’s visual adaptations of some of the icons depicted on the envelopes create a strange nostalgia paired with an unsettling lack of focus. In fact, the closer we get to the images ( or the dream of a new State? ), the more out of focus they appear to us… How close and how removed are we today from these collective constructions ? Prof. Moshe Zuckermann has written an essay about Morein’s work in the catalogue, originally published on the occasion of the show’s first presentation in Tel Aviv’s Zaritzky House in 2009. He will give an introduction at the opening of this new presentation at the Bauhaus Center on May 8, 2014 at 7 p.m.
Andrea Morein was born in Vienna. She grew up in Germany where she lives and works. She came to Israel as a student more than 40 years ago, and left again for Europe a few years later. However, her profound link with Israel has remained alive throughout the years. 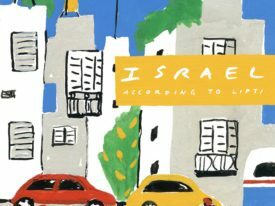 In the last few years, she had several solo shows in Tel Aviv ,i.e. „Night My Light“ at Kibbutz Gallery, 2012 ; „..continuing from where we left off“ at Artists’ House, 2009, Tel Aviv. Her videos, installations, drawings and photographic works have been shown in galleries and museums in Germany & Europe, i.e. : Jewish Museum, Vienna; Bochum Museum, Germany; Jewish Historic Museum, Amsterdam; Frauen Museum, Bonn; Museolaboratorio Città S.Angelo, Italy; Goethe Institutes Brussels, Paris & Lisbon; Gallery Kunstraum21, Cologne/Bonn; Gallery plan d, Düsseldorf; Roman-Germanic Museum Cologne; BBK, Cologne; Municipal Museum artothek, Cologne; House of World Cultures, Berlin; Artists’ Residence, Herzliya.